Vivendi is a vast French based media empire with activities in music, television, telecommunications, the internet and video games. A group that is continually gaining market share, is owner of the world’s largest music company, Universal, and the biggest video-gaming company, Activision Blizzard. Think World of Warcraft and Guitar Hero. Now cut to 2002, before Jean Bernard-Levy came onboard as CEO. Cut to a business close to bankruptcy, overstretched and exhausted from the megalomaniac regime of previous chief Jean-Marie Messier. Through a number of sales and a refocus on core business capabilities, Levy pulled Vivendi out of the water and back onto dry land. The group which turned a cool $14m in revenue for 2010 may credit Levy with having the Midas touch. Yet the soft-spoken and low-key 55 year-old would likely brush this off for something far more modest. Yes, he may have spent a year outside the French system in the UK as a ‘gifted student’ and had success follow him at every other corner, but this father of four and avid skier is unlikely to talk himself up. Looking back, Levy was extremely efficient at driving a disciplined, conservative approach to curb the company’s over-ambitious growth strategy under Messier. Levy put Vivendi on a strict diet, completing sales of a number of its non-strategic assets and reigning in its American Depositary Receipt program then delisting on the NYSE. 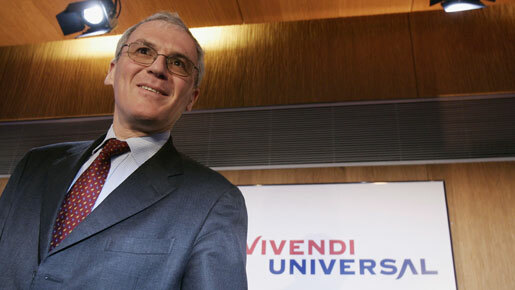 Vivendi stripped the company down to bare bones, before fleshing it out again, this time dropping the ‘Universal’ from its name and focusing on building up existing assets. After a period of consolidation and focus on in-house growth and development, Levy shifted his focus back outside, leading a number of successful mergers that have provided significant value to the Group and enabled it to return to position of clear market leader across various media facets. Levy led the Canal Plus merger with TPS, France’s second largest Pay-TV provider, in 2005; closed the Activision Blizzard merger at an astonishing $18.9bn in 2008; and last year outbid Spain’s Telefonica, to purchase Brazilian phone operator GVT. Levy is often credited with using a step-by-step approach to rebuild Vivendi from the bottom up, with a sense of patience and quiet determination that is often likened to his personal nature. Levy’s vision for the company follows a similar trajectory to that used in his own career path. Vivendi’s strategy is multi-disciplined and focused on creating synergy between different functional areas. Similarly, the professional background of the Ecole Polytechnique graduate is diverse, cutting across a range of varied roles and swivelling between the government and private sector. From commencing his career as an engineer at France Telecom, Levy’s been almost everything: a manager, political advisor, director of Human Resources, and banker. The self-described opportunist managed to get around his parent’s ambitions to become a doctor; his gastroenterologist father simply ‘worked too hard’. Most recently, Levy held positions as Chairman and Chief Executive at Mantra Communication and also acted as Managing Partner of Corporate Finance at French equities broker, Oddo & Cie. He has served as CEO of Vivendi since April 2005. Given his current position, Levy’s ability to transpose value across completely opposed positions and through a suite of industries has no doubt worked out in his favour. His ability to ‘connect the dots’ in his work career has carried across to Vivendi, where Levy built the company back up using a multi-disciplinary approach that focused on investment in current assets, geographic expansion, and active product innovation. What Levy does next with Vivendi will make for interesting viewing. Where the roads in the wood divided for the company the first time, Levy bought them together again and reinstated the Group’s market position as leader of the global media industry. The same roads appear to be dividing again, as Levy is at a crossroads in terms in defining the company’s strategic direction. The current economic climate and the growing competitiveness of the digital distribution market is calling for Levy to focus in on a core strategy rather than rely on a multi-pillared approach that is still leaving some confused with Vivendi’s value preposition. The numerous business areas means the company still looks like a mishmash to some. Many investors are calling for extra cash to be used on buying out minority stakes in assets rather than pursuing emerging market opportunities. This strategy would enable the company to shed its holding discount and enter investor peripheries as a growth stock. Levy, however, seems determined to expand, recently stating that ‘you cannot say you are a global content company if in some way or other you do not properly address a few billion out of these emerging countries’ populations’. It is unlikely that Levy will be able to lead Vivendi down a passage of bullish expansion into emerging markets while simultaneously applying a conservative, streamlined approach that hones in on core businesses and focuses on improving products from the inside out. Levy must ensure he is not seen as diversifying for the sake of diversifying, so as to have his hands in all the baskets of entertainment at the expense of creating strategic advantage in existing businesses. No mean feat, and perhaps akin to the real World of Warcraft. How Levy manages the group’s reliance on subscriber related revenue will also be interesting to watch. The sustainability of a business model focused on subscription and customer loyalty in a market that is evermore driven by free, share-based access and networks is certainly unique – although there is little doubt that the Frenchman won’t be able to pull it off in his signature steady style. No doubt cross-pollination and finding synergies is part of Levy’s flair. For his Vivendi to maintain a leading edge, Levy will need to engage in a delicate balancing act between consolidating value in already established core businesses and pursuing growth opportunities. Viewers should stay tuned to Levy’s channel: under his strategic stewardship, the ride promises to be interesting.